The American Adventure is an elaborate Audio-Animatronics stage show at the American Adventure Pavilion in Epcot's World Showcase. The Show:"Hosts" Ben Franklin and Mark Twain present a dramatic and inspirational story of America and its people. Through a magical mix of motion pictures and "Audio-Animatronics" imagineering, you'll witness the struggles of the Pilgrims and early Colonists. See the Revolution from a foot-soldier's point of view. And watch as a young America discovers its western frontier. Share in the adventure as never before, as the Civil War, the Great Depression and global conflicts temper and strengthen the American national character. Finally, the images of America today re- affirm our country's greatest resource, our people, and challenge us all to continue the American Adventure. In the dramatic 29-minute presentation, one of the most elaborate ever created using Audio-Animatronics® figures, hosts Benjamin Franklin and Mark Twain take guests on a journey into the birth of a new nation and the resulting spirit of its creation. Through the magic of Audio-Animatronics and an innovative combination of film and special effects, the show features such "performers" as Thomas Jefferson, Frederick Douglass, Susan B. Anthony, Alexander Graham Bell, Teddy Roosevelt, Charles Lindbergh, John F. Kennedy and Martin Luther King Jr.
Disney "stage directors" have drawn reactions and movements from the Audio-Animatronics actors never before accomplished. "With live acting, the essence of a message may be caught in a moment; two actors making eye contact, or a subtle move of the body," said figure animator Dave Feiten. "In the Valley Forge scene, for instance, two Audio-Animatronics figures are hunched over against a chilling wind. As they converse, one of the soldiers takes just a split second to raise his head and look at his fellow compatriot. These are things that aren’t in the script but they give the figure that extra feeling of life." Research for the American Adventure began almost three years prior to its 1982 premiere. Careful attention was given to ensure that the presentation is historically accurate, according to researcher Melissa Rhone. For instance, in a scene depicting the Great Depression, pages of quotes from Will Rogers were gathered by Walt Disney Imagineers to incorporate into the scene. In order to duplicate the advertisements of the Depression era, architectural magazines were scanned. Music logs were searched to find an appropriate song for the banjo player on the porch -- "Brother Can You Spare a Dime?" In addition to obtaining Franklin D. Roosevelt’s 1933 inaugural speech, Imagineers wrote to the Library of Congress for a copy of his unusual presidential seal to duplicate for his podium. The show is held in a 1,024-seat theater complete with rich, Corinthian-style details: chandeliers, archways, columns, elegant fabrics and paneling. The theater includes the Spirits of America, twelve "marble" statues lining both sides of the theater, representing such American qualities as heritage, innovation, knowledge, pioneering, discovery and freedom. In 1993, the show was updated to include a new generation of Audio-Animatronics figures, re-recorded audio tracks and a dramatic new ending sequence. 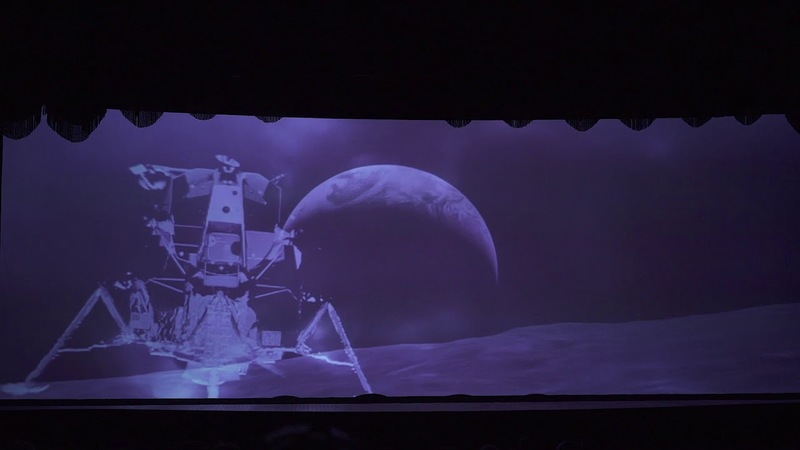 The new "Golden Dreams" ending sequence encompasses events from 1945 through the present. Notable new additions include Ryan White, the young hemophiliac who succumbed to AIDS after a courageous battle with the disease, Muppet creator Jim Henson and basketball star Earvin "Magic" Johnson. Will Rogers - Will Rogers, Jr. Brother, Can You Spare a Dime?" "In the Days of '76"
"Westward Ho! - The Covered Wagon March"